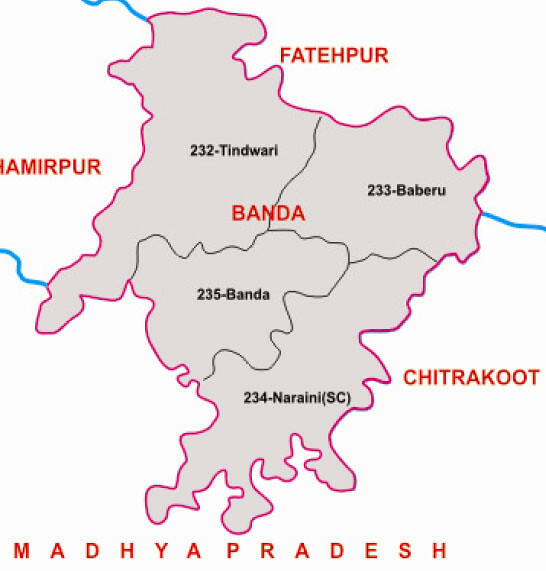 There are four legislative assembly constituency in Banda district for the 2017 Assembly elections. They are 233 Baberu, 235 Banda, 234 Naraini, 232 Tindwari. When Uttar Pradesh assembly election 2017 is getting ready to electios new Assembly, Banda is not anywhere behind in the election heat. Banda District (Hindi: बांदा जिला) is a district of Uttar Pradesh state of India, and Banda is the district headquarters. It is a part of Chitrakoot Division. Banda is famous for its Shajar stone, used for making jewellery, and the historically and architecturally significant sites Khajuraho and Kalinjar. Khajuraho is a World Heritage Site famous for its elaborately carved temples. The fortress of Kalinjar is famed for its war history and its glorious rock sculptures.